This new pavilion was designed for Marble Arch, a central London location with exceptional history and position between Hyde Park and the tail of Oxford Street. 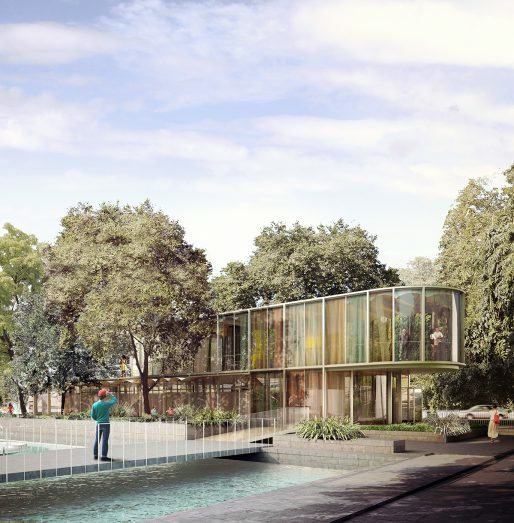 Our proposal for a light building intends to strengthen the square’s heritage context and its connections between Hyde Park and the West End while solving the multiple challenges of a busy and noisy traffic island. John Nash’s triumphal arch, the existing landscaping, sculptures and fountains, the square’s basement and London Underground entrance, and the proximity to Hyde Park and the Regency Terrace of Connaught Place gave a complex context that influenced the architecture.